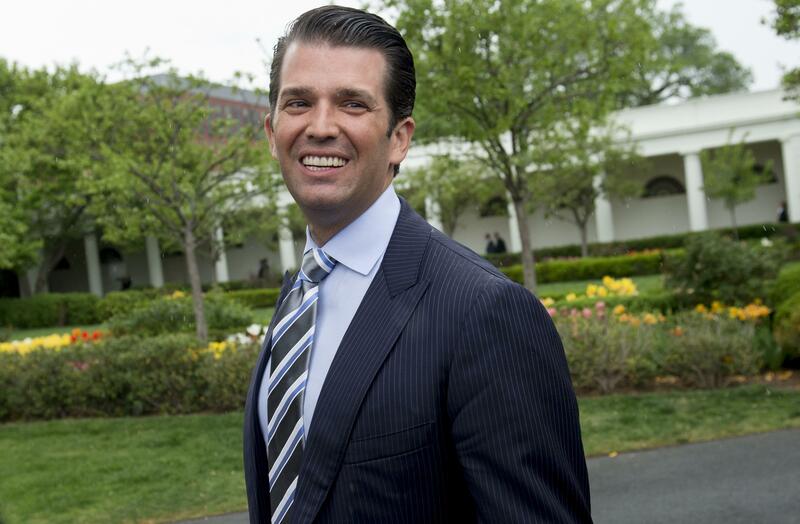 On Tuesday, after the publication several reports detailing a January 9th meeting between President Trump's eldest son Donald Trump Jr. and a Kremlin-linked lawyer, Trump Jr. released his own copies of emails sent in the lead up to that meeting. The exchange included communication between Trump Jr. and Rob Goldstone, a music publicist who facilitated the arrangement for a meeting with Natalia Veselnitskaya, who was described in the emails as a "Russian government attorney." The emails referred to information that would "incriminate" Hillary Clinton that Goldstone wrote would be "very useful" to Trump Jr.'s father. "This is obviously very high level and sensitive information but is part of Russia and its government support for Mr. Trump," one of Goldstone's emails said. Veselnitskaya has since denied ever working for the Russian government or that she had compromising information to share with Trump Jr. and his associates. Speaking on behalf of Mr. Trump, Deputy White House Press Secretary Sarah Huckabee Sanders delivered a statement on Monday, saying "My son is a high quality person and I applaud his transparency." She directed all further inquiries into the situation to Trump Jr.'s attorney and outside counsel. Speaking to reporters on Capitol Hill following the release, McCain said, "I've said many times in the past there's another few that will drop and there will be other shoes that will drop." He added, "I know it's serious, but I've said a long time ago it's serious and this is a serious situation, one that is a long way from over." Addressing Hill reporters, Kaine said the release "delivered wheelbarrows full of new evidence to the special prosecutor and to the intelligence community." "We are now beyond obstruction of Justice in terms of what's being investigated," added Kaine. "This is moving into perjury, false statements and even potentially treason." "The Vice President is working every day to advance the President's agenda, which is what the American people sent us here to do. The Vice President was not aware of the meeting. He is not focused on stories about the campaign, particularly stories about the time before he joined the ticket." It is now incumbent on elected officials of both parties to stand up & do their duty: protect & defend the constitution. "This is a sad day for our country. The email chain confirms that the President's son was both aware of and supported the Russian government's efforts to help the President get elected," said Cummings in a statement. "I remind my colleagues from both parties—the Constitution does not give Congress the right to remain silent in the face of this threat. We must investigate. And we must act on our findings." "There's no escaping it: the Trump Campaign's inner circle met with an agent of a hostile foreign power to influence the outcome of an American election," said Pelosi in a written statement. "The American people face a White House riddled with shadowy Russian connections and desperate to hide the truth. One after another, senior Trump officials have been caught hiding secret meetings with Russian agents. The incendiary news of the meeting arranged by Donald Trump Jr. is a grave development in the investigation of Trump officials' possible collusion with Moscow." "When we began this investigation 6 months ago, into any possible ties between the Russians and Trump officials, we got a constant refrain that there was nothing there, yet we've seen this pattern repeated now close to 20 times where senior Trump officials have constantly forgotten or omitted previous conversations with Russians, then, when they were shown evidence of those conversations they've had to recant," Warner told reporters on Tuesday. He added that Trump Jr. and Trump associates have "a lot of explaining to do", noting that he was "sure" Trump Jr. is going to appear before the intelligence committee, which Warner serves as Vice Chairman. "On their face, they're very disturbing it seems to be a an offer to assist the campaign, the campaign seemed to be willing to be assisted," Graham told reporters on the Hill. He added, "When you're offered assistance from a foreign government to your campaign the only answer is no, so I'm not going to condemn the guy on an email, but this is something that is most problematic thing I've seen thus far." When pressed on his trust in Mr. Trump amid changing stories about the administration's meetings with Russians, McConnell was brief with reporters, saying, "The investigation in the Senate's being handled by the intelligence committee, and I'm sure they'll get to the bottom of whatever may have happened." Speaking to reporters, Schumer called the release of the emails, "the end of the idea pushed by the administration and the president that there is absolutely no evidence of intent to coordinate or collude." He added, "Between these revelations, and the president's horrendous handling of the meeting with Mr. Putin, it's clear that congress needs to step in and sanction Russia and be a roadblock to lifting sanctions, 'cause clearly the president will not be tough with Mr. Putin, as he should be." At a press conference Tuesday afternoon, Schiff called the emails "very significant, deeply disturbing new public information about direct contacts between Russia and the very center of the Trump family, campaign and organization." He added, "Obviously, we need to get to the bottom of exactly what happened, what was said in that meeting any information that went into organizing that meeting and if that meeting was just the beginning or was a testing of the waters by he Russians to see if the campaign would be receptive to their engagement and involvement" in the election.